Need a last-minute dessert to bring to a Halloween party? These simple and festive brownies have you covered. They're super simple to make because they start with a brownie mix and kids love these Halloween brownies because they're topped with mini marshmallows, candy corn and chocolate chips. You could easily play around with different small candies for garnishing, but this combo is like a Halloween version of a s'mores topping. The recipe is great fun for the whole family and a great opportunity to include the kids in the baking process. If you are bringing these to a school, make sure your brownie mix is nut-free, as lots of schools have this as a rule because of the prevalence of nut allergies. Preheat oven to 350 degrees F. Spray a 9x13-inch pan with cooking spray. Mix the brownie mix, oil, water and eggs with a spatula or wooden spoon, about 50 strokes, until well-combined. Spread brownie batter in prepared pan. Bake 23 minutes. Remove brownies from oven. 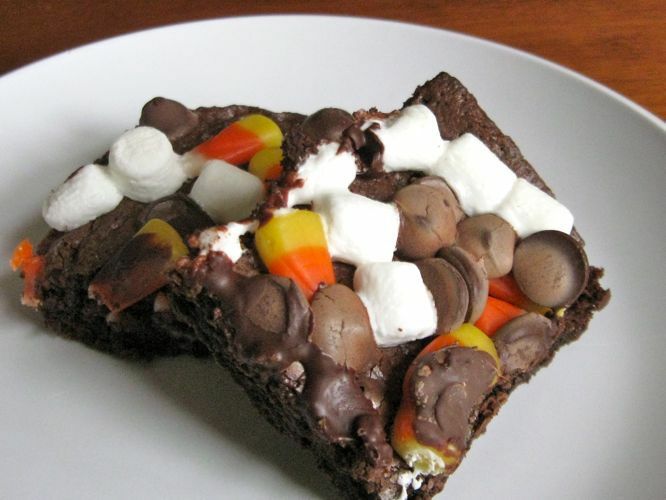 Sprinkle mini marshmallows, candy corn and chocolate chips over brownies. Return to oven and bake another 5 to 8 minutes.